I seem to read books, listen to music and watch TV shows and films faster than I can blog these days, and since I haven’t written a TV show review in a while I thought I would do a little round-up post of five shows I’ve watched recently. Plus, although I enjoy watching one season at a time of most shows, I’m not sure anyone else would want to read six separate posts of my in-depth analysis of each season of Game of Thrones, y'know. I’m going to contradict myself already. Although I just said that I watch shows faster than I can blog, I still seem to make extremely slow progress compared to the rest of the Netflix-loving world and am continually behind the times. Just to put that into context, I published my review of the first season of House of Cards last June, which is almost a year ago now. There’s no easing into the second season, from the first episode you’re straight back into the corruption and mind games of the White House. I’m not going to drop any plot spoilers, but the first episode is definitely the most shocking thus far, and this along with the fact that Frank Underwood ignores the camera until the very end of the episode, when he directly addresses the viewer in the show’s signature style, had me kicking myself for neglecting the second series for so long. Overall, I haven’t felt that this season has been quite as gripping as the first, but there’s a lot more going on and it’s constantly moving forwards in a way that makes me feel as though it’s building up to something big. I’m not sure I’ve ever experienced a programme that has attracted so much attention so quickly. Whilst there are loads of shows that crop up again and again on Twitter (Pretty Little Liars and Game of Thrones I’m looking at you), the concentration of attention that this documentary series received, both online and in daily conversations with friends and colleagues, was incredible. The series follows the story of Steven Avery, a man who spent 18 years in prison after being wrongly convicted of sexual assault and attempted murder. The first couple of episodes focus on this first conviction, before moving onto his later trial for a separate murder case. Making a Murderer attempts to unveil the corruption of the police and authorities, and it is because of this that the documentary has gathered so much attention. Whilst I found it a really interesting and quite unsettling watch, I didn’t seem to find it quite as addictive as those who watched all 10 episodes in extremely quick succession. Something I struggled with was the vague way in which the documentary unravelled; there was no narrator and big parts of the series of events seemed to be missing, with little or no explanation. For a documentary that aims to shine a light on the ways in which Steven Avery’s cases weren’t conducted thoroughly, honestly or accurately, this lack of clarity in delivery was a bit of a problem for me. Although this American teen mystery-drama has been around since 2010, it was only last year that I first became aware of it, and I have a feeling that this had something to do with Netflix. Whilst this show is a very typical of American teen dramas in following the ups and downs of high school life, it has the added intrigue of a thriller and crime-based plot. It can feel a little clichéd at times, but the first season of Pretty Little Liars is full of suspense and plot twists, and it’s completely addictive. It’s been tough dodging spoilers for this show, but I’m genuinely looking forward to watching the next few seasons, as I think it’s only going to get more intense. Game of Thrones is without a doubt the show I’ve sped through the most quickly; since posting my review of the first season at the end of March, I’ve already finished the next two. Believe me, I could have watched the entire five series twice over by now if I didn’t have to go to work every day. I’m so glad I made the decision not to read the rest of the books first because it has been such an exhilarating and emotionally exhausting experience watching each episode since the beginning of season two. There’s only one TV programme on my list that I’ve been watching on live television and not from Netflix or box sets, and that is The Durrells, which is currently showing on ITV on Sunday evenings. The six-part drama series is based on Gerard Durrell’s autobiographical books about his and his family’s time spent in Corfu in the 1930s. It’s a very easy and relaxed watch, but is full of beautifully charismatic individuals and endearing events that highlight so many familiar aspects of family relations and (often) ridiculous aspects of British culture and behaviour. 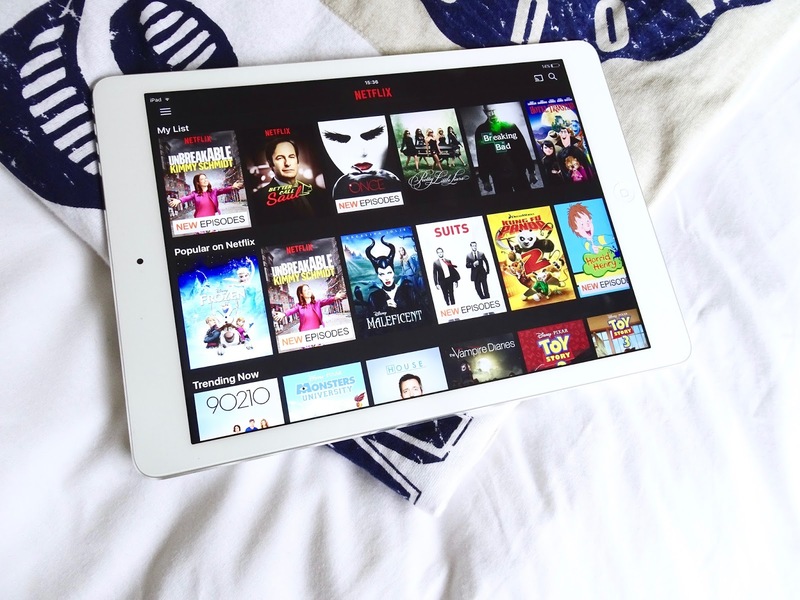 I’d love to know what you’re watching at the moment, whether it’s currently on TV, can be found on Netflix or is a box set you’ve had on your shelf for years – let me know in the comments!